120cm/48" around x 22cm/8 1/2" deep. 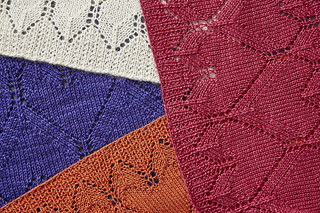 Knit Play Colour contains ten patterns. 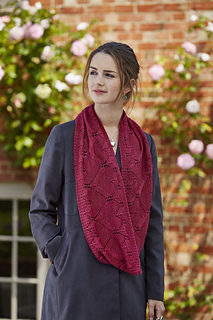 The patterns are being previewed on Ravelry through September, with the final pattern being revealed when the book is released on 29th. Art Deco hearts that catch the light. 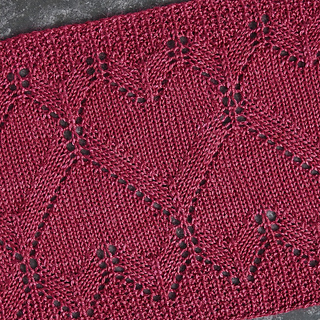 I love this lace not only for the simplicity of the hearts, but also due to the play of light on yarn. 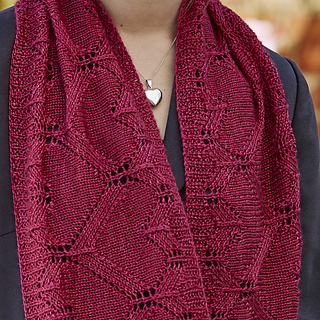 The shifting stitch directions become quite abstracted, especially when the cowl is twisted up double. I think it makes the design a quieter statement. Worked in the round, this is an intermediate lace project. BOTH written instructions AND a chart are included. 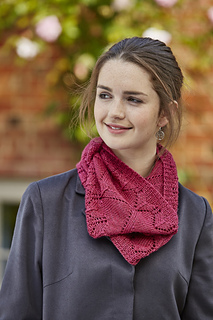 At the end of every pattern in Knit Play Colour, you will find ideas on how to “play” with the design. 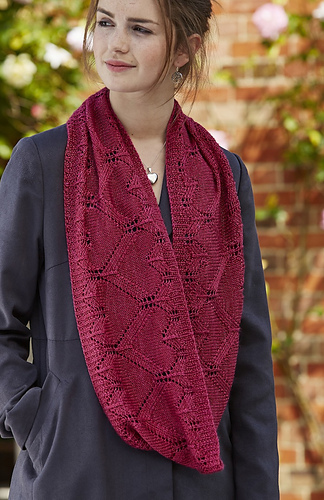 You can play with the colour and weight of yarn. A table lists the number of stitches to cast on for gauges ranging from 18 to 28 sts per 10cm. This means you can use this pattern for yarns ranging from laceweight to aran/worsted. All the help you need is in the Play section at the end of the pattern. with the Warm Hearted blanket pattern instead (which will be revealed shortly). Since the blanket is worked flat, it’s easier to play with for other flat projects. 120cm/48” around x 22cm/8 1/2” deep. 3.75mm/US 5 needles for working in the round – dpns, or circulars with 80cm/32” cable. 10 x stitch markers to separate pattern repeats plus a different marker for start of round. Nature’s Luxury Farouche (65% silk, 35% camel, 400m/440yds per 100g skein) 1 x Grenadine. 22 sts x 30 rnds per 10cm/4” square over Stocking Stitch/Stockinette (or 22 sts x 35 rnds over lace pattern) after wet blocking using 3.75mm/US 5 needles or size needed to get gauge. Choose a favourite colour and make it personal: Eden Cottage Yarns Askham 4ply (70% baby alpaca, 30% silk, 200m/218yds per 50g ball) 2 balls x Crocosmia. 3.5mm/US 4 needles. Try it in sport weight: Blue Sky Alpacas Metalico (50% baby alpaca, 50% raw silk, 135m/147yds per 50g skein) 3 x Opal. 3.75mm/US 5 needles. Make it cosy in DK/light worsted: Triskelion Yarn and Fibre Amaethon DK (75% superwash Merino, 25% silk, 225m/246yds per 100g skein) 2 x Cepheus. 4.5mm/US 7 needles. For more about playing with this pattern, including more information about these ideas, visit the Heart Deco blog post.